We all know Washington state’s capital region for its iconic 287-foot dome, but courtesy of the team here at Experience Olympia, visitors now have 20 more, iconic locations to explore while in town. Launching this fall, visitors will find selfie-ready signs–coined “Selfie Spots”–at scenic, historic, iconic and some even secret (until now) locations. 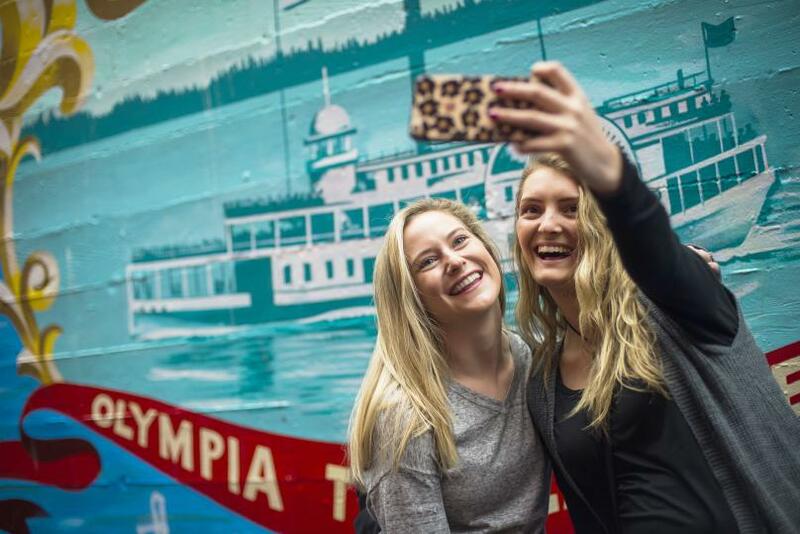 Selfie Spots range from popular attractions like Tumwater Falls or the Kissing Statue at the waterfront to under-the-radar, locally loved locations like the Old Tenino Bank or Saint Martin’s Staircase. The full list is included below. What’s your favorite time of day to photograph? The best time of day is early morning when the light is soft and evening for golden hour. What time of day should people consider for photographs–anything specific for wildlife and scenic views? Try avoiding high noon with the sun is directly overhead. Wildlife are more likely to be active in the early morning and late evening as well. During our Fall and Winter months, the best time is the afternoon when there&apos;s a chance of a sun break or at least the sky is the brightest. Sunsets and sunrises are amazing around the Pacific Northwest, any tips for capturing them? The HDR setting on the iPhone is pretty impressive and helps a lot when capturing sunrises and sunsets. Focus on the sky and colors and let the foreground go dark or use silhouettes to add interest. When photographing people, any creative angles or ideas for maximizing the shot? Play with perspective - move around the subject and try lots of different angles. I like creating symmetry and placing a person right in the middle, or I use the rule of thirds and place subjects on the third facing into the frame. The selfie – how do you master it? Find your better side (we all have one). Natural, indirect light (like from a window) is the best, but if you&apos;re outside, block the sun with your head to get a bright glow. If you feel super awkward like I do, bring a friend in for a group selfie! Anything else to add? Keep taking photos in between poses- you may end up with a funny expression and nice real moment. Learn more about Tegra and her work at www.tegrastonenuess.com , Facebook and Instagram. Find details on where to drink, dine and stay at experienceolympia.com. Snap your selfie or suggest new spots by tagging your post #DecidedlyDifferent or share with us via Facebook, Twitter (@Experience_Oly) and Instagram (@ExperienceOly).